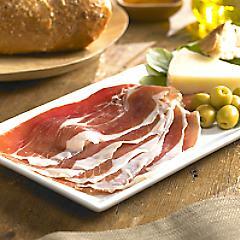 All Natural Hand–Sliced Jamon Serrano! Introducing a new, hand–sliced Jamon Serrano from Monte Nevado. It is the only all natural Spanish ham for purchase in the US right now. Please see the link below for more information. Canned tuna isn’t held with particularly high esteem. It’s usually hidden under gobs of mayonnaise and sandwiched on bad white bread. 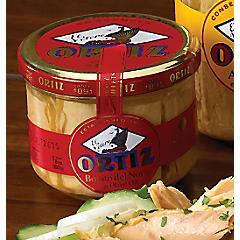 Spanish canned tuna is a totally different story. It’s harvested in northern Spain, cooked in seawater, and packed in good quality olive oil. It’s not at all dry – in fact, its texture is almost silky. Best left in its olive oil with maybe just a bit of good salt and freshly ground pepper. Perhaps a piece of toast or some good sliced tomatoes, but a fork alone is just fine. Paella pans should be evenly heated if you want to make perfect paella. It’s worth investing in a special propane burner to ensure the best paella possible, especially if you’re using a pan big enough for a crowd! You can buy them here: http://www.tienda.com/paella/paella_burners.html. Boquerones are the great Spanish white anchovies pickled in vinegar and stored in olive oil. Since they’re not preserved in salt, like most anchovies, they don’t have the intense saltiness usually associated with anchovies. Instead, they’re mild and tender. 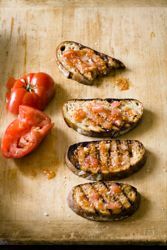 Great on pan con tomate or just a toothpick! Mark and Claudia ate these in a pintxo bar in San Sebastián with Juan Mari Arzak. This is one of the easiest ways to prepare mushrooms, but it is also decadent and impressive. The Basque Country is known for its mushrooms, and you find this dish in pintxo bars all around the region. Heat 1/4 cup of the oil in a large skillet over medium–high heat. Add the mushrooms and sauté for about 5 minutes, or until beginning to soften. 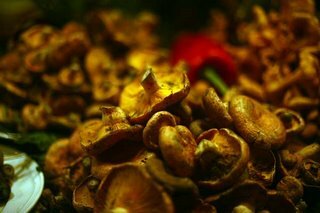 Add the garlic and cook for 3 to 5 minutes, or until the mushrooms are nicely browned and softened. Remove from the heat and cover to keep warm. Fry the eggs sunny–side up in the remaining 1 tablespoon oil in a large nonstick skillet until the whites are set but the yolks are still runny. Transfer to a cutting board and cut away the whites from the yolks (discard the whites). Spoon the mushrooms onto four plates and sprinkle with the parsley, salt, and pepper. 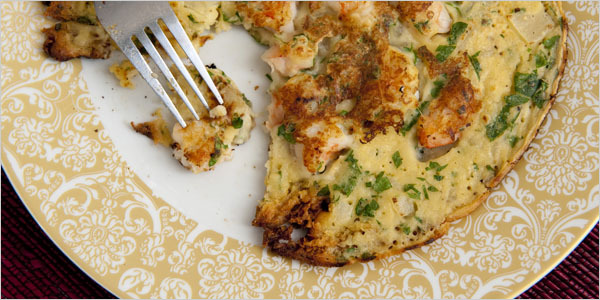 Make a little space in the center of each portion of mushrooms, and nestle the yolks in the mushrooms. As you eat, mix the yolk with the hot mushrooms to create a rich, silky sauce. In Galicia, Mark and Mario found the bread from that particular regions very delicious and full of flavor. Give it a try in your own home with olive oil and a speckle of salt! "A COUPLE of years ago, a friend took me to Taberna Toscana, in Madrid. "We don’t need a menu," he said. "We’ ll get the veal shoulder and the tomato salad, like everyone else." 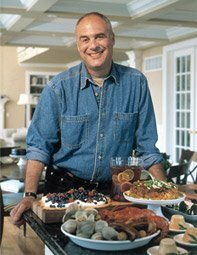 He was both right and wrong; those dishes were amazing, and I ate them the next couple of times I went there. Mario and I took a little side trip to Girona, a small, historic city north of Barcelona. Walking through its old Jewish Quarter was one of the most memorable parts of the trip for me. Unfortunately we didn’t get to visit one of my favorite Barcelona spots on this road trip, but it’s worth visiting should you be in town. It’s called Quimet y Quimet and it’s roughly the size of a large walk–in closet. They prepare small bites, mostly interesting combinations of preserved and pickled food. It’s quirky, a little funny, and totally eccentric. Some of the world’s best salt – huge crystals with a clean, round flavor – is harvested on Mallorca’s coasts. There’s a fun trend of grinding different flavors with the salts – hibiscus and black olives, for example. Mario and Claudia tried them at Felipe Jordi’s apartment in Mallorca with Chef Benet Vicens. The mixtures lend wonderful flavor to meats and fish, pastas and salads. 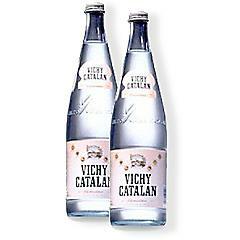 Vichy Catalan is mineral water from Catalunya that some people adore, some not so much. It’ s got a bit of salinity to it, and a full, mineral—y flavor. The best way to drink it is probably with a slice of lemon and a splash of vodka. Mario and Gwyneth prepared pan con tomate (bread with tomato), perhaps the most emblematic of all Catalan food, at the Rene Barbier vineyard. It is served everywhere with everything and is more a method than a recipe. Gwyneth especially loves it when it’s topped with a few boquerones (anchovies). Grill the bread or toast it under the broiler until browned on both sides. Rub with the garlic and drizzle with as much olive oil as you like. Rub and smash the tomato against the bread so that the pulp saturates the toast. Sprinkle with salt, and enjoy. While in wine country, Gwyneth and Mark met up with a local chef named Nino. He arranged for a wonderful lunch consisting of vegetables fresh from the lush Basque landscape. He put a metal grate on the ground, piled grape vines on top, and set them on fire. 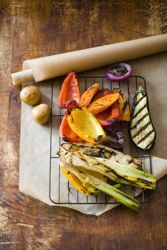 When the vines burned down, he threw some salt on the fire “to give it a little life,” then grilled endive, carrots, leeks, eggplant, onions, and peppers. He served the grilled vegetables with boiled potatoes and borage, all doused with coarse salt and olive oil. And that’ s the recipe, folks. Fire, vegetables, good salt and olive oil.